Helga v nesnázích - volně ke stažení! Pro vás, naše fanoušky máme dnes jedno velké překvapení - od 1.4.2014 uvolňujeme naši poslední hru Helga v nesnázích volně ke stažení! Veškeré informace o hře nadále naleznete na adrese hry: helgagame.com včetně linku ke stažení. Helga Deep in Trouble - Now available! 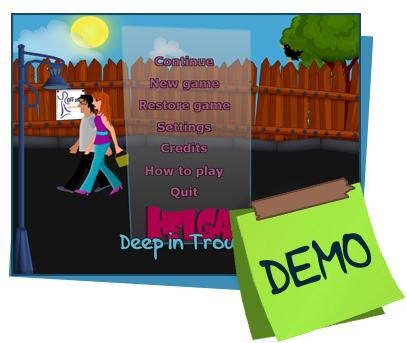 Starting on September 26th 2013, you can play our new adventure game Helga Deep in Trouble. The game has been through quite a complicated development process. The development stopped for 2 years, at one point the game was rewritten from scratch, and from the originally planned 10 locations it grew to over 40. Anyway, if you want to know what it takes to make videogames when you're a woman in charge of a bunch of nerds, play our game Helga Deep in Trouble! Helga Deep In Trouble - New website! Off Studio is looking for a proof-reader for the English version of Helga Deep in Trouble. The proof-reader should be a native English speaker. There's quite a lot of text to go through, approximately 44,000 words. Admittedly, a lot of time has passed since the last news post (somehow the time goes by too fast for game developers:-) so even though there was a lot to write about, I just never got to updating the web. The greatest news is that the adventure game Helga Deep in Trouble is nearly complete! What does it mean, exactly? All the art, animations and game logic are done. First rounds of beta testing are finished. Helga is currently waiting for musing and sound effects, produced by Vojta Nedvěd, who worked with us in the past on Wilma Tetris. You should be able to play the game in the first quarter of the year 2013. We'll try to keep you entertained in the meantime, though. You can expect a new trailer and perhaps something more palpable - both very, very soon! Are you looking forward to Helga Deep In Trouble?